With the exception of one meal this week (the fish taco bowls), these dinners are courtesy of a very hard-working kitchen appliance: the oven. It's nice to be able to get the dishes cleaned up and the table set while dinner is cooking away in the oven. Even better, it's nice to have a few moments to relax before the dinner-clean-up-bath-time-bedtime frenzy begins. Thanks for doing what you do, oven! I really will try to clean you more. 1. Fish Taco Bowls from The Live-in Kitchen. This is a recipe that Anne recommended, and she said it was a favorite at her house. I make a lot of similar Tex-Mex style rice bowls and they're always a hit. This one, with spicy seared fish (I used tilapia), was no exception. I love how adaptable these types of recipes are; it's so easy to change-up based on what's in the fridge or what your favorite things are. We'll be making these again for sure! 2. Mini Pizza Pockets from Six Sisters Stuff. You know me and my never-ending search for more ways to combine bread, cheese, and pepperoni. This recipe is a keeper, not only because it was cheap, easy, and good, but also because Jona liked it too. Cue the angel choirs. I'm thinking next time I try this one I might just have to hide some veggies in these pockets (or at the very least puree some carrots into the tomato sauce). 3. Gluten Free Breakfast Casserole from Iowa Girl Eats. I'm always pumped to have breakfast for dinner. I love breakfast...savory, sweet, it's all good. This casserole, which combines hash brown potatoes, sausage, eggs and cheese was so simple to make. It was a plate-full of some of my favorite breakfast fixings, all rolled into one. 4. Baked Chicken Parmesan Meatballs in Tomato Cream Sauce from Annie's Eats. In my opinion, nothing says "I love you" like meatballs. I don't know what it is, but to me meatballs have become one of the ultimate comfort foods. These, which I made with ground turkey, were moist, flavorful, and just about melted in my mouth. Oh, and then they're covered in delicious melted mozzarella and nestled in tomato cream sauce. Swoon. Have you made anything yummy lately? 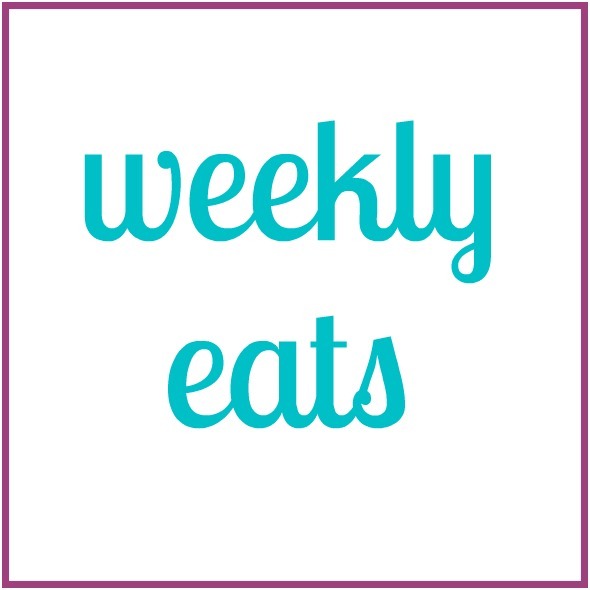 I'm going to do another Weekly Eats linkup on Friday, February 27. I'd love it if you shared your kitchen creations! 4 years ago: wearing navy dots with red, white, and gray. 2 years ago: wearing stripes buttoned over a 15-week belly. I always get great dinner ideas from your blog. I love anything Mexican and Tex-Mex. The taco bowls look really good. And I will definitely have to try the pizza pockets. My kids would love those! Great idea about hiding veggies in them! oh, my how yummy everything looks. Now i'm so hungry. Have no idea what to cook for dinner. this week have been struggling with dinner ideas. Breakfast for dinner is seriously the best. I love brinner!! The fish taco recipe sounds good too, we love our Mexican food and are always looking for new ideas to try! Speaking of Mexican, that's what we're having tonight - homemade nachos. Healthy? Probably not. Tasty? Yep! fish taco bowls? love this idea. fish tacos are one of my favorite meals, but i'd never thought to ditch the shell and put it in a bowl - it looks so good! Oh so glad you liked the fish taco bowls! We probably have those about once a week. Meatballs have been a hit around here lately too - will have to try this one. Thanks for all the great ideas as usual! Me too--Mexican/Tex Mex is always a winner at my house too. And the pizza pockets were instant favorites here too--they were easy too, which is always nice. Mmm, homemade nachos sound great. Sometimes you need a treat. And yes, I could do breakfast for dinner any time! And Mexican. I love fish tacos too, and this was a nice change-up. I bet it would be good with shrimp too! I think those pizza pockets might be a hit in our house too. That's smart of you to try to sneak some veggies in there. I'm also going to have to try those meatballs. I'm always so impressed that you fit in so many new recipes in just one week. Thanks Megan! I think sneaking veggies in there will work, fingers crossed! 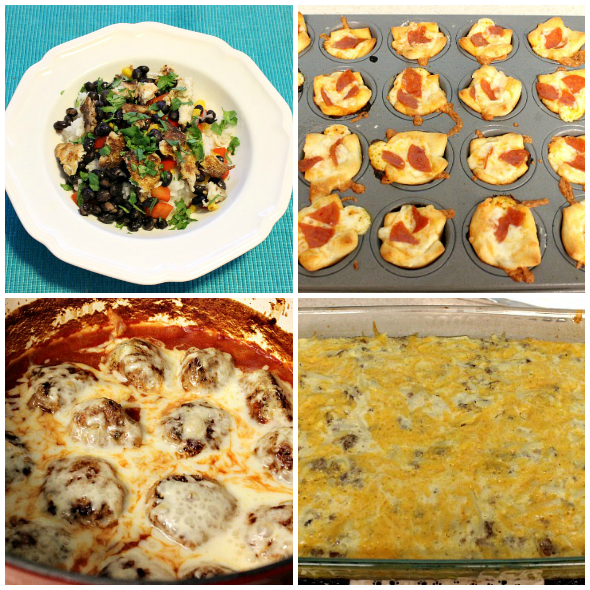 I try to do a mix of new and old recipes every week (the meatballs are ones we've tried before). Planning our meals for the week is one of my favorite things to do, and luckily Aaron doesn't mind the experimenting with new recipes :) But some weeks are better than others. Those pizza pockets look soooo yummy! I'm going to have to try those! Thanks Jenna! They were really good, and really easy (the best part)! The mini pizza pockets look perfect for kids. Will have to try that out this weekend! Yum, it all looks so good! Those little pizza are too cute! Thanks! Yes, they're very kid-friendly I think! This all looks so delicious - especially the fish taco bowls and pizza pockets - yummy! Oh man, those pepperoni bites are making my mouth water--and I don't even like pepperoni! Thanks Chrissy! They were good--especially the fish taco bowls! Thanks Lauren! They were really good, and you could really throw anything in them!